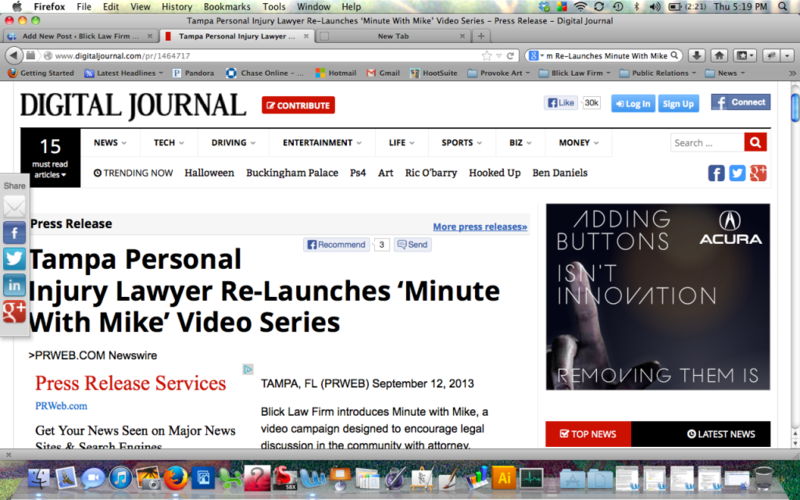 Blick Law Events is hosting an official launch event this November 6 from 5 to 9 p.m.
New and improved Tampa Bay Law Firm hosts red carpet event and looks forward to seeing you there!! To RSVP visit www.BlickLawEvents.com by October 31 to get on the list. The event will be led by attorney, Michael C. Blickensderfer and staff and welcomes all to stop by their new location on 3812 Gunn Highway. Blick Law Firm’s slogan is helping the hurting. The firm holds to Christian-values to serve the community and its clients. At the event a special donation will be recognized; the firm has hand-picked a charitable foundation to financially contribute to and recognizes them for their efforts in giving. Former Tampa Bay Buccaneers player, Ryan Nece, established the Ryan Nece Foundation to be a beacon to teens by empowering them to impact giving in their communities. The Ryan Nece foundation’s board members will accept the charitable donation from Attorney, Michael Blickensderfer at the launch party. Michael Blickensderfer has been practicing law firm over 25 years. Blick Law Firm has diverse bilingual legal team meeting the communities legal needs in: personal injury, auto and motorcycle accidents, wrongful death, criminal defense, bankruptcy, title services, short sale, foreclosure defense and immigration law. This Tampa-based legal team is focused on achieving a positive outcome for clients while providing high quality personal service. Blick Law Firm’s guiding principles include honesty and integrity, and a percentage of its proceeds support mission work and charitable organizations. For more information, visit http://blicklawevents.com/. Over the past couple of years there has been an increasing trend in the number of car accident claims. A personal injury claim arises when a party suffers an injury with lasting consequences as a result of the actions of another party. The recent rising trend of injury claims is attributable to various reasons. As a result of the rise in personal injury claims, preventative steps are being put in place on the road. Recent news may help to decrease car accidents claims in Florida; Texting while driving for those living in Florida has officially been banned. Reporter Holly Sinn from Channel 1o News covered the story on October 1, 2013. Sinn states, The “Wireless Communications Device Prohibition” that went into effect makes it a secondary offense, which means police have to first stop drivers for another offense before they can issue a ticket for texting. There are a lot of exceptions to the law, which also allows for texting at stoplights, as well as single-button functions while the vehicle is in motion. The law more clearly stated below clears up confusion for drivers. 316.305 Wireless communications devices; prohibition. (a) Improve roadway safety for all vehicle operators, vehicle passengers, bicyclists, pedestrians, and other road users. 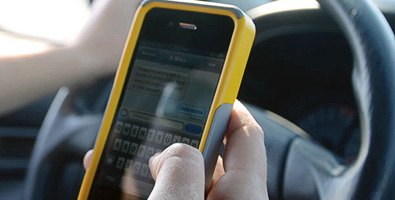 (b) Prevent crashes related to the act of text messaging while driving a motor vehicle. (c) Reduce injuries, deaths, property damage, health care costs, health insurance rates, and automobile insurance rates related to motor vehicle crashes. (d) Authorize law enforcement officers to stop motor vehicles and issue citations as a secondary offense to persons who are texting while driving. (3)(a) A person may not operate a motor vehicle while manually typing or entering multiple letters, numbers, symbols, or other characters into a wireless communications device or while sending or reading data 1on such a device for the purpose of nonvoice interpersonal communication, including, but not limited to, communication methods known as texting, e-mailing, and instant messaging. As used in this section, the term “wireless communications device” means any handheld device used or capable of being used in a handheld manner, that is designed or intended to receive or transmit text or character-based messages, access or store data, or connect to the Internet or any communications service as defined in s. 812.15 and that allows text communications. For the purposes of this paragraph, a motor vehicle that is stationary is not being operated and is not subject to the prohibition in this paragraph. 1. Performing official duties as an operator of an authorized emergency vehicle as defined in s. 322.01, a law enforcement or fire service professional, or an emergency medical services professional. 2. Reporting an emergency or criminal or suspicious activity to law enforcement authorities. 4. Using a device or system for navigation purposes. 5. Conducting wireless interpersonal communication that does not require manual entry of multiple letters, numbers, or symbols, except to activate, deactivate, or initiate a feature or function. 6. Conducting wireless interpersonal communication that does not require reading text messages, except to activate, deactivate, or initiate a feature or function. 7. Operating an autonomous vehicle, as defined in s. 316.003, in autonomous mode. (c) Only in the event of a crash resulting in death or personal injury, a user’s billing records for a wireless communications device or the testimony of or written statements from appropriate authorities receiving such messages may be admissible as evidence in any proceeding to determine whether a violation of paragraph (a) has been committed. (4)(a) Any person who violates paragraph (3)(a) commits a noncriminal traffic infraction, punishable as a nonmoving violation as provided in chapter 318. (b) Any person who commits a second or subsequent violation of paragraph (3)(a) within 5 years after the date of a prior conviction for a violation of paragraph (3)(a) commits a noncriminal traffic infraction, punishable as a moving violation as provided in chapter 318. (5) Enforcement of this section by state or local law enforcement agencies must be accomplished only as a secondary action when an operator of a motor vehicle has been detained for a suspected violation of another provision of this chapter, chapter 320, or chapter 322.